Evening dress with short sleeves or no sleeveless? The sleeves of an evening gown characterized much of the appearance of l woman who will wear it. And if one wants to be stylish in her dress, it is better to choose the style that fits us and which does not betray us. A dress with long sleeves may be perfect for some women, but not for others and the same thing for dresses with short sleeves. Chouchoudress has a range of evening with and sleeveless dresses in her collection. Here are some details on the sleeves of evening dresses with a few models of dresses evening chouchoudress. The sleeves of an evening gown depend on the style that the Creator wants to bring the dress, and the final appearance also which he wants to have. As such, the result will be different at the discretion and style that he wants to see. On the side of the evening dress, short sleeves may bring a more elegance and discretion over a sleeveless dress, and a side chic compared to an evening gown with long sleeves. According to the taste and the morphology of the woman who is wearing the dress, it will add the beauty style sleeves that she chose short long or sleeveless evening dresses for bustier. This is an example of a short-sleeved evening dress. This outfit is part of the new collection in the category of cheap evening dresses of chouchoudress. If we closely analyze this pretty dress, that is what is. It is a strapless dress short-sleeved blue color consisting of a rhinestone belt. We can greatly admire the beauty and the more than these short sleeves brings to the evening dress, particularly at the top level of the whole, i.e. on the bust. Composed carefully in accordance with the bust, sleeves also offer a big very chic side, because it’s a strapless dress. Other details that give importance to these sleeves short are rhinestone belt and skirt fabrics bunk. Clearly, one can admire and associate these components that provide a perfect harmony. Rhinestone belt is defined as the center of the dress and chiffon fabrics layered skirt gives a stunning effect. This is a very chic evening short-sleeved dress. Another model of short-sleeved evening dress, this is it. This is the chouchoudress black short evening dress. A dress that is within the reach of everyone since its price is very attractive. 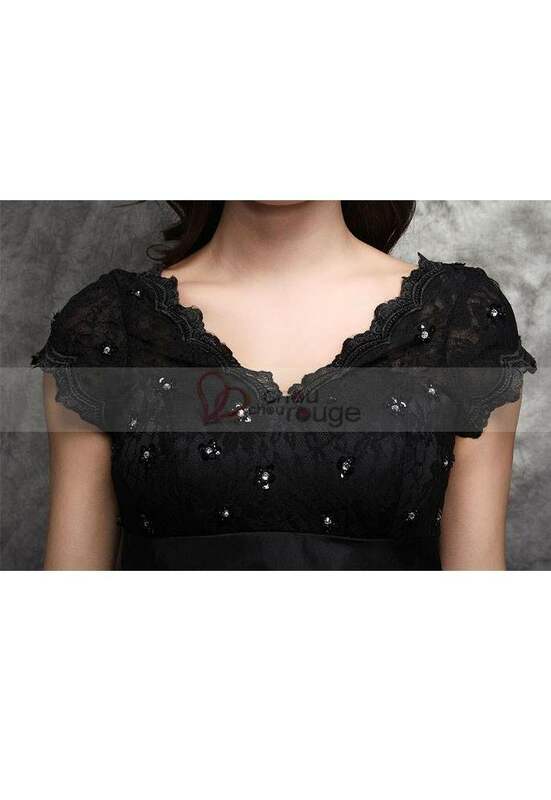 Black short evening dress is also categorized as cheap evening dresses of chouchoudress. The beauty of the dress is indisputable with his style and this skirt which is appears with grace. If we focus on short sleeves, they are associated and with the bust and decorations that are there. We can also observe these seams in lace and the decorations precious stones visible on the bust and sleeves. Short sleeves make the dress more than simple details; these are related components that revive the style and the posture of the woman who wear this pretty beautiful evening dress.